Sometimes having an iCloud backup of the data on your device is not enough. To ensure the safety of your data, you might want to have an additional copy of these files on your computer or another device. In this article, we are going to show you how you can create this copy for safe keeping. Apple allows users to make copies of some data from iCloud to PC or Mac. This is a really great way to ensure you will always have the data even if you accidentally delete the file. Let’s see how to do this with your photos and videos. Tap on Settings > iCloud Photos and then select “Download and Keep Originals” and import the photos to your computer. You can also download the photos from www.icloud.com. Simply sign in and select photos. Choose the photos you want and download them to your PC or Mac. You can do this with all other types of data including your documents, Notes, Safari Bookmarks, Contacts, Mail, Calendars and Reminders. 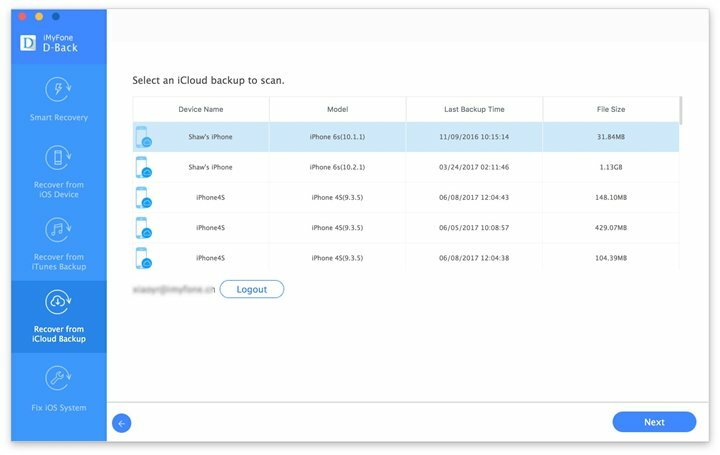 While the method above may work to help, you make copies of some data in your iCloud backup, it is not completely fool-proof. To begin with, you can’t copy all the different file types at the same time, This means that it may take quite some time when you want to copy all the data on your iCloud backup file. If you don’t want to make that kind of time investment, iMyFone D-Back for Win or iMyFone D-Back for Mac is a solution that you want to try. 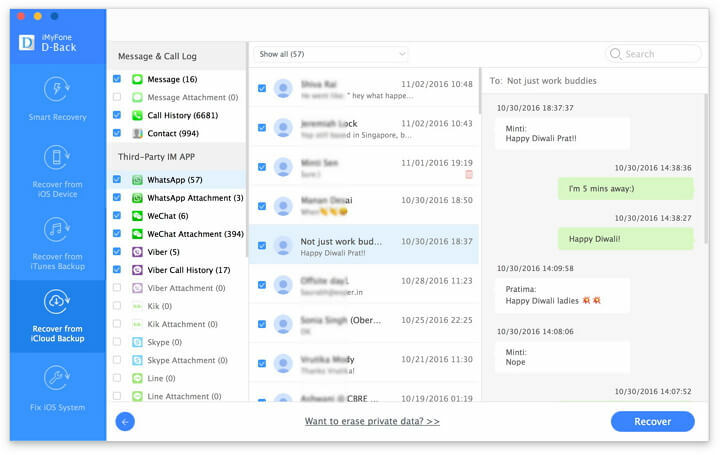 Not only will this program save you a lot of time by allowing you to copy all data in one go, it will also allow you to copy more data such as text messages and WhatsApp messages. The following are some of its features. 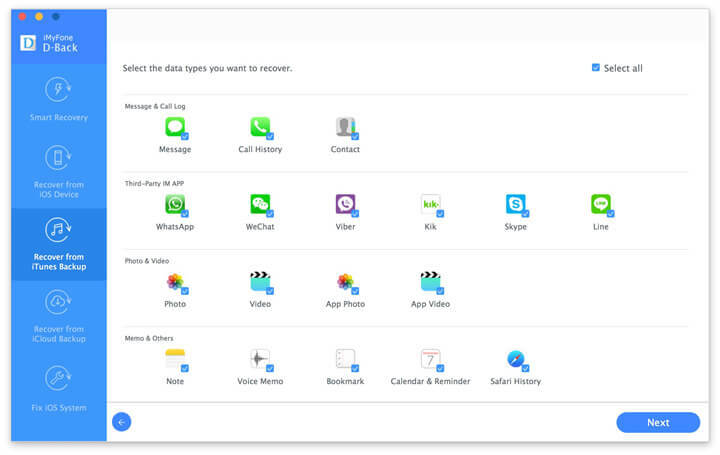 It can be used to view and copy up to 22 different types of data from an iCloud backup including 3rd-party app data such as WhatsApp, Kik, Viber, Line and WeChat. Its preview function means you can choose which files to copy. You copy all the files to your computer in a few simple clicks. Step 1: Download and install the program to your computer. Launch it and then select “Recover from iCloud Backup.” Click “Start” and in the next window, select the data type you want to copy. You can choose to copy the data which is listed in the windows. Click “Next”. Step 2: Sign in to iCloud and then select the backup file whose content you want to copy. Click “Next” to allow the program to scan the selected backup. Step 3: From the results page, select the data you want to copy and then click “Recover” to copy the data to your computer. With Apple’s solution, you can only copy one type of data at a time. With iMyFone D-Back, you can select all types of data and copy everything at one go. Copying one type of data at a time is time consuming and slow. iMyFone D-Back saves you a lot of time by allowing you to copy all files in just a few minutes and a few simple clicks. Not all types of data can be copied using Apple’s solution. iMyFone D-Back allows users to backup all types of data including third-party app data that Apple will not allow you to copy.